Keith Wilson, a law student at Oxford University, has uncovered evidence whilst studying the detail in the text of the Lisbon Treaty that shows amendments to the Ten Commandments, famously brought down by Moses and placed into the Ark of the Covenant. *Lord to be defined as person of high authority; only to be recognised in regulated premises that have passed the necessary audits and inspection schedules. For full details please go to chapter 19, sub section 6, paragraph 4. *** God, and all other terminology relating to omnipotent beings, do not exist within the confines of any legal establishment. Outside of these establishments people are free to engage in beliefs relating to said deities, a full list of types and descriptions can be found in the multicultural reference encyclopaedia. 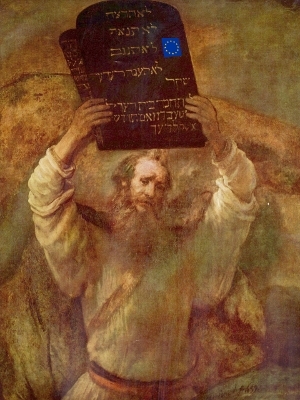 Moses was reprimanded by EU officials for holding such a heavy stone tablet above his head without wearing a hard hat.